ALBUQUERQUE, N.M. — Researchers at Sandia National Laboratories and the University of New Mexico are comparing supercomputer simulations of blast waves on the brain with clinical studies of veterans suffering from mild traumatic brain injuries (TBIs) to help improve helmet designs. Paul Taylor and John Ludwigsen of Sandia’s Terminal Ballistics Technology Department and Corey Ford, a neurologist at UNM’s Health Sciences Center, are in the final year of a four-year study of mild TBI funded by the Office of Naval Research. The team hopes to identify threshold levels of stress and energy on which better military and sports helmet designs could be based. They could be used to program sensors placed on helmets to show whether a blast is strong enough to cause TBI. These computer simulations contain a computer model of a human's head viewed from above looking down (top row) and from the side (bottom row). 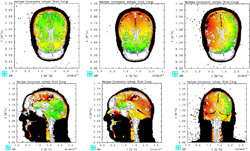 The images show the deposition of compressive energy in the brain during frontal, rear and side blasts. 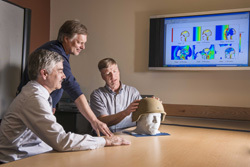 These models combined with University of New Mexico's clinical observations are being used to identify energy thresholds that should lead to better military and sports helmet designs. (Image courtesy of Sandia National Laboratories) Click on the thumbnail for a high-resolution image. Many TBI sufferers experience no or subtle immediate symptoms that may keep them from seeking medical attention. The sensors could alert them to a potential problem. The study is the only TBI research that combines computer modeling and simulation of the physical effects of a blast with analyses of clinical magnetic resonance images (MRIs) of patients who suffer such injuries, Taylor said. Immediately following blast waves, soldiers can suffer brief losses of consciousness, but more damage evolves weeks later, Ford said. The symptoms — headaches, memory loss, mood disorders, depression and cognitive problems — can prevent sufferers from working, he said. Taylor is applying shock wave physics to understand how sensitive brain tissue is affected by waves from roadside bombs or blunt impacts within the first 5-10 milliseconds. That’s before a victim’s head moves any significant distance in response to the blast. “This stuff is over before you have any chance to react and probably before you even knew it happened to you,” Taylor said. Humans’ fastest reaction times as teenagers are 75-100 milliseconds. At Sandia, researchers created a computer model of a man’s head and neck. The model includes the jaw — another first in TBI research — because a lot of blasts come from improvised explosive devices (IEDs) at ground level, sending waves traveling at the speed of sound through the jaw and facial structure before they reach the brain, Taylor said. Sandia’s team used the National Library of Medicine’s Visible Human Project, which was established in 1989 to build a digital image library of volumetric data representing complete, normal adult male and female anatomy. Paul Taylor, right, and John Ludwigsen, center, both researchers with Sandia’s Terminal Ballistics Technology Department, and Corey Ford, a neurologist at the University of New Mexico's Health Sciences Center, discuss their research on traumatic brain injuries. 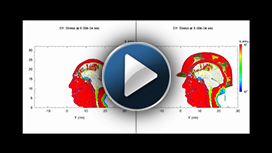 The researchers are comparing supercomputer simulations of the physical effects of blast waves on the brain with Ford's analyses of patients who have suffered such injuries. (Photo by Randy Montoya) Click on the thumbnail for a high- resolution image. Using images of the male, whose age was close to that of most military personnel, Taylor, with Ford as a medical consultant, created geometric models of the seven tissue types in the human head — scalp, bone, white and gray brain matter, membranes, cerebral spinal fluid, and air spaces. Over a year, they catalogued each of the tissue types seen in about 300 “slices” of the cadaver’s head, dividing what they saw into one-millimeter cubes and assigning each a tissue type for the computer simulation. Taylor also imported digitally processed, computed tomography (CT) scans of various helmet designs into the simulations to assess the protective merits of each against blast loading. In a typical blast simulation, 96 processors on Sandia’s Red Sky supercomputer take about a day to process a millisecond of simulated time and at least 5 milliseconds are required to capture a single blast event, Taylor said. The 3-D simulations are visualized using two-dimensional multi-colored images of a man’s head that record an enormous amount of data. Taylor and Ford have focused on three types of energy entering the brain that may cause TBI: compressive isotropic energy associated with crushing; tensile isotropic energy that tends to expand parts of the brain and could lead to cavitation; and shear energy that causes distortion and tearing of soft tissue. The pressure and stress within the brain show up as colors moving in slow motion through and around the brain cavity on videos created from the simulations. On the clinical side, Ford studied 13 subjects who suffered mild TBI after IEDs exploded near them. Some were stunned, most lost consciousness at least briefly, and most cannot hold a job, he said. The research partners hope to recruit more patients, especially military veterans, who were exposed to blasts that did not penetrate the skin and who suffered a loss of consciousness, Ford says. Candidates must have no other history of significant blunt traumas. A battery of tests measured the subjects’ memory, language and intelligence. These results were correlated with changes in functional magnetic resonance imaging (fMRI) from the patients. The 3-D fMRI studies can detect and map networks in the brain used for processes like movement, vision and attention. By comparing this data with those of a control group, Ford identified a subgroup of networks displaying abnormal brain activity in the patients. These results were then compared with energy deposition maps predicted by the computer simulations. The research showed that certain regions of patients’ brains are hyperactive, perhaps because they are compensating for adjacent, damaged areas of the brain that were hit with high energy from the blasts. The hyperactive regions are those that experienced the least shear and tensile energies, according to the computer simulations, which can be used to predict where the hyperactivity will likely occur, they say. The studies also showed problems with how the patients used visual information, which corresponded to their complaints about having difficulty with attention spans, Ford said. “This is our way to validate what the simulation shows with the clinical reality,” he said. Once Taylor and Ford determine exactly how and where the wave energy deposited in the brain gives rise to injuries, they can provide thresholds of stress and energy levels that cause TBI for consideration by helmet designers, Taylor said. For more information about Sandia’s Defense Systems & Assessments work, click here.